Contains defined projects and more nebulous things I’m working on which might become fully-fledged projects at some point. Bunting season is nearly upon us – an incipient royal wedding (with accompanying jingoism and jelly at street parties), a clutch of bank holidays and the next thing you know it’ll be summer and time for fairs, picnics and barbecues. 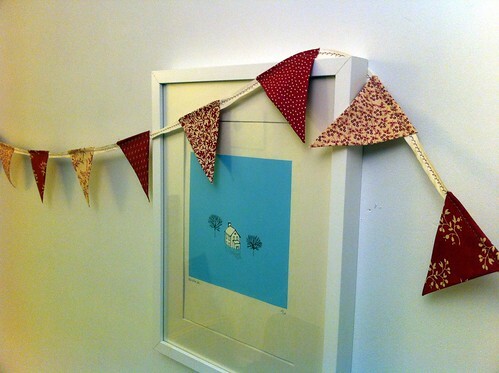 But you don’t need an excuse for bunting, really. 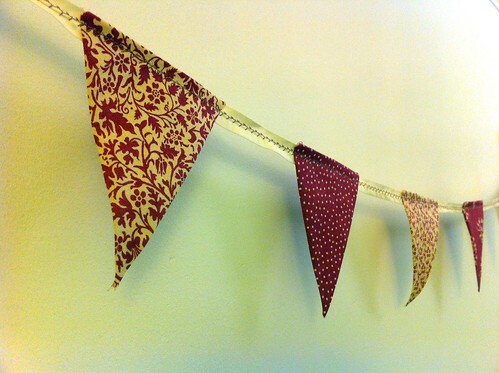 I like bunting. I’ve never really had a reason to string it outside, but my study (painted white) has a picture rail running around the top of the wall, and I had an idea to string some miniature bunting along it (and along the frames of a couple of pictures) as a sort of alternative decoration. 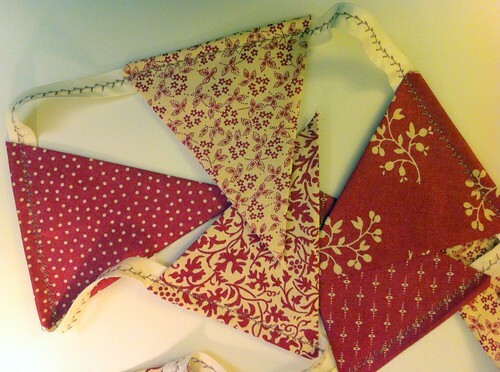 So I did a bit of online research (of course) and discovered that you can pay not very much for fairly ugly and cheap-looking big flappy strings of bunting. You can pay quite a lot for the fruits of someone else’s labour on etsy, folksy or ebay and the like. Or you can make it yourself. 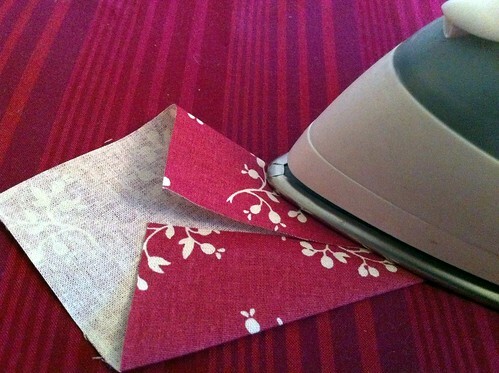 Several of the methods I found require cutting things out with pinking shears (I don’t have any, and John Lewis were out of stock when I went in to check) and/or making shapes which you sew and turn inside-out (far too much faff). So I decided to see if I could figure out a way to make simple no-sew, no cut shapes which would look good front and back, not fray on the edges and would have some structural integrity. I came up with his origami-inspired kite-shape approach. 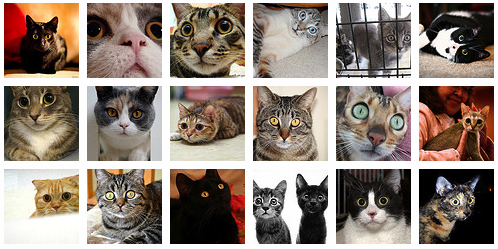 Click through this set on Flickr to see step-by-step instructions with photos. 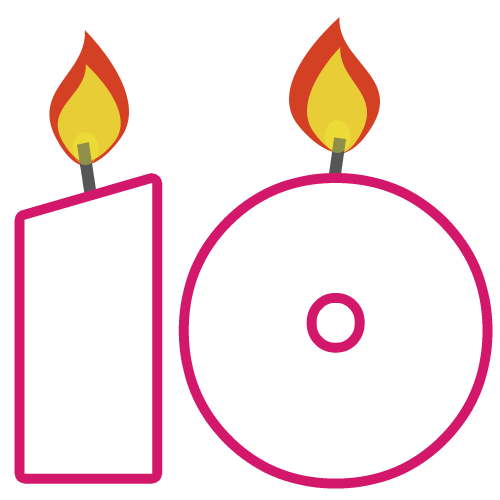 I know the first rule of blogging is “never apologise” but I’m sure one of the other rules is something like “keep it up” which I have been woeful at doing recently – the terrible timing, so soon after my celebratory tenth blogiversary postings, was noted and probably deeply significant.